Nissan SUV models are priced for any budget and have attractive safety features. Indeed, some vehicles in the Nissan SUV fleet have five-star side impact ratings, with the Xterra receiving a best in class award in professional reviews. When you are shopping around for vehicles, it is important to know what features are available. This will help you decide what you are looking for in an SUV, allowing you to make a more informed choice. Nissan introduced its first light truck in 1980, the Datsun Truck, before introducing the compact MPV Stanza in 1984. It wasn't until 1986 that the company introduced its first SUV, the mid-sized Pathfinder. This remained the company's only sport utility vehicle until 2000, when Nissan introduced the compact SUV Xterra. A second, short-lived compact SUV followed in 2005, the X-Trail. Nissan introduced a full-sized SUV, the Armada in 2004. Nissan offers several different models of sport utility and crossover vehicles. Even within a single model, there may be several variants. Pathfinder: The Pathfinder seats seven in its three-row seating configuration. The vehicle is available with either a 4.0- or 5.6-liter engine. You can add on optional navigation, entertainment, and value packages to help you get around and stay entertained and comfortable while you get there. You can also purchase the protection package, a group of extra safety features that includes an emergency road kit, wheel locks, and an impact sensor. Nissan has redesigned the Pathfinder several times, and the vehicle entered its third generation in 2005. The company updated the Pathfinder with a cosmetic facelift for the United States and the Middle East in 2008 and the rest of the world in 2010. A V-8 engine was introduced with the 2008 facelift, the same engine as the Nissan Titan. Armada: Nissan's Armada comes in three models: the SV, the SL, and the Platinum. All are available in two- and four-wheel drive variants. All models offer a 5.6-liter engine. You can also add five packages onto the vehicle, including an entertainment package, a moon roof, a driver package with a Bose stereo system and fog lamps, a tow package, and captain's seats in the second row. For long trips, you can add on roof rails and a rear cargo net. The vehicle was originally dubbed the "Pathfinder Armada," though this name was dropped in 2005 in favor of simply "Armada." In 2010, two models were dropped from the Armada line -- the SE and the Off-Road. Nissan has performed no major redesigns of the Armada, a recent addition to the Nissan fleet. 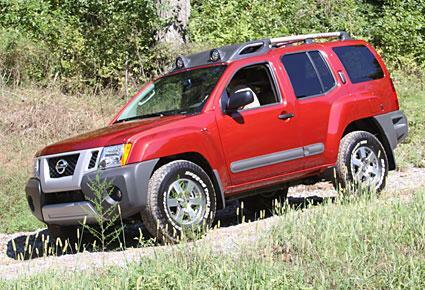 Xterra: Nissan offers three different models of Xterra. These include the X, S and Pro-4X. All models have a 4.0-liter, V6 engine and include a roof rack. Options include a leather package and a value package that includes step rails and fog lights. You can also get step rails individually. Other individual options include a cargo organizer, retractable cargo cover, tow package and emergency road kit. Nissan has redesigned the X-Terra twice, with the second generation debuting in 2005. In 2009, the vehicle underwent a facelift, adding leather seats to the SE and roof-mounted head lamps to the Off-Road edition. X-Trail: Nissan introduced the compact sport utility vehicle, the X-Trail in 2005. The car didn't last long, with Nissan producing models for the United States for only two years. The company replaced the car with the Nissan Rogue in Canada, but it has no obvious successor in the United States. The car continues to be popular internationally, particularly in Mexico. The X-Trail received a facelift in 2010 for the international market. Nissan SUV models are available at a variety of prices that can fit almost any budget. Lower-model vehicles start at lower prices, while the higher-end SUVs offer a little something more for those with extra cash in their pockets. These cars tend to hold their value well, but you can find a good deal on a used Nissan SUV too. Keep a running list of all the things that you need in an SUV. Ranking the things you are looking for in an SUV can also help make looking for a new car easier. Remember to stick firmly to what you want and don't want in a vehicle, even after you begin talking to a car salesman. This will prevent you from taking home something different than what you really want.